If you have an 02-06 R53 MINI Cooper S this is the catback exhaust you want. The stratmosphere is the most beautiful exhaust on the market in every way. The look, the sound, the fitment, the craftsmanship. You get dialed-in fitment with hand-finished components by the builder topped off by double-chrome stainless WMW tips. This system is extremely easy to fit very quickly and behaves with a sound that everyone will enjoy. Systems are fully stainless inside and out and have been tested and verified at our USA headquarters. This is a full catback exhaust system. It bolts directly to the flange behind the factory cat so no cutting or welding is required and your emissions is NOT effected. 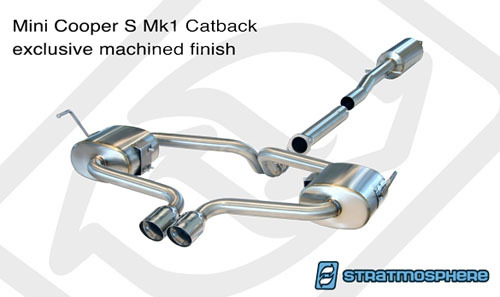 The stratmosphere catback is made entirely of stainless steel so it will most likely outlast the car. This MINI Cooper S catback exhaust will improve the exhaust flow while balancing the back pressure to give you maximum torque gains. But at the same time this exhaust will give you a nice tone, a little louder than stock, and no ricey honda sound. Also is has NO DRONE on the highway, a big plus as this is a common problem with most other exhausts. 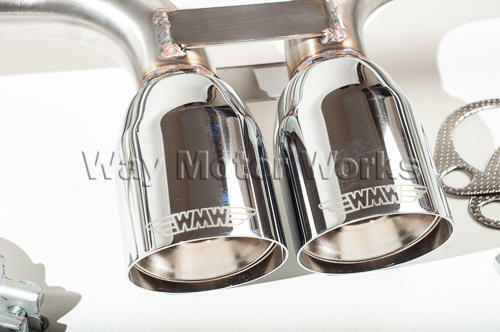 Way Motor Works uses this exhaust on his person car, and 2 other family members MINI's, so that says alot. Noticed a nice little power gain and the sound is great not too loud and no drone. It also fit great. I simply adore the build quality and I'm simply astonished that a stainless exhaust could actually be lighter than the stock. Tips: I highly recommend just cutting the old exhaust out as that was the slowest part and ended up tearing a mount by not doing so! Also slide the center clamp on the mid section before inserting and mounting the center piece! Amazing cat back system. Noticeable increase in torque. Volume and tone is perfect, mellow at cruise and idle with no drone but aggressive at wide open throttle. Very nice fit. Looks good, sounds good. No fitment issues and well constructed. Great recommendation from Way. Fitment was perfect. Sound is great, mellow and throaty with absolutely no droning at speed. It took me longer to remove the old system than to install the new one! I gotta say, I don't think it's wishful thinking either, but I definitely noticed a torque and horsepower gain with this exhaust. I got the resonated version and it's not much louder then stock till you put your foot down as another reviewer mentioned. Beautifully made. Mine is a tad tight on the chrome tips at the rear exit but have no issues. Well worth it I think.